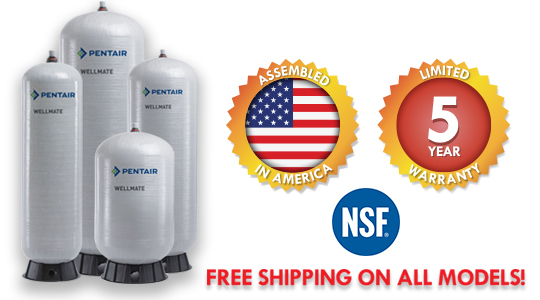 All the proven performance features of WellMate water system pressure tanks are built into durable, easy to install retention tanks designed to provide optimum contact time during chemical treatment. Our lightweight, seamless, totally non-corrosive retention tanks are ideal for new and replacement installation where durability is at a premium. 16" X 44" 30 gallons 30 lbs. 16" X 56" 40 gallons 38 lbs. 21" X 37 1/2" 40 gallons 38 lbs. 21" X 67" 80 gallons 50 lbs. 24" X 73" 120 gallons 73 lbs. WellMate Vacuum Breaker - 1/4"